A warning sign posted by opponents to a proposed toxic waste disposal site in the woods, near the Housatonic River in Great Barrington, Mass. 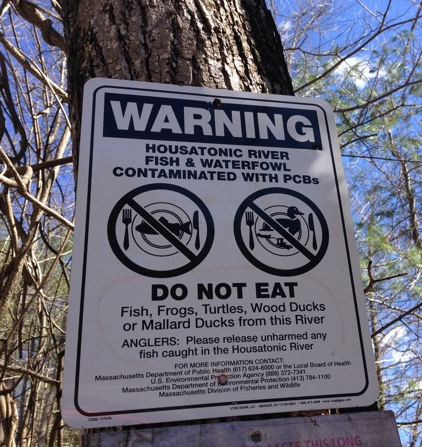 Chris Windram, a fisherman and a board member of the Housatonic River Initiative, wants the PCBs removed from the river, but opposes putting disposal sites near it. Fisherman Chris Windram leads the way to the river, past a sign warning people not to eat the fish because of PCBs. The river may contain a toxin, but the water sparkles in the bright sun. And there’s fish. If Windram were fishing for trout today, he’d use a lure that mimics an insect that he spots under the water. The relationship between fish and insects provides a lesson on how PCBs climb up the food chain. The toxin binds to sediment on the river bottom. Insects ingest the PCBs. Then fish eat the bugs. Birds, mink and -- sometimes -- people eat the fish. The EPA says PCBs can cause cancer. When the agency banned them in 1979, a GE plant upstream of here in Pittsfield had already released them into the river. GE is on the hook for the cleanup -- and wants to dump the sediment in three toxic waste disposal sites close to the river, which the company has said, would be safe and cost-effective. 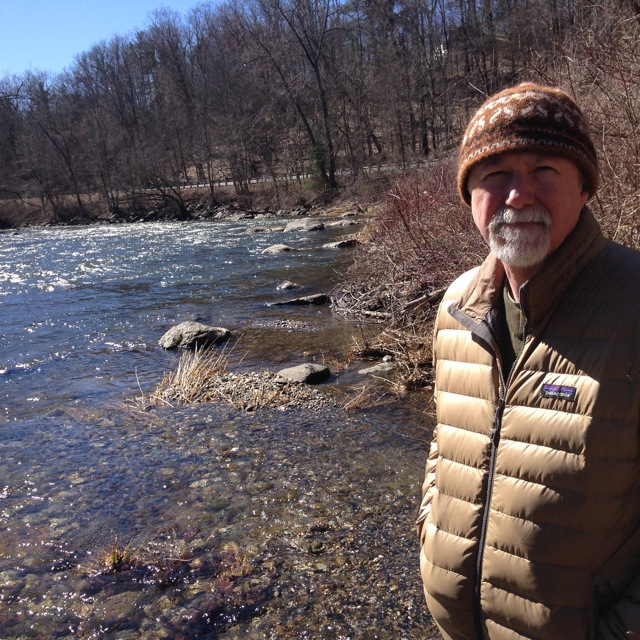 Chris Windram, who is on the board of the Housatonic River Initiative, doesn’t buy it. At least one proposed disposal site borders the river’s edge. “I think it’s sort of disingenuous of GE to dig the PCBs up from the river and put it a couple of hundred yards away,” Windram says. The EPA has a different plan. The agency wants GE to dig up 990,000 cubic yards of river sediment containing PCBs and ship it to federally approved disposal sites — none of which are in New England. A fish advisory next to a path to a fishing spot on the Housatonic River. Danny Reible is an environmental engineer from Texas Tech University, who researches the management of contaminated sediments. (He has served as a consultant for both the EPAand GE, but not on the Housatonic clean-up project.) Reible says PCBs can be safely disposed of next to a river, in part, because, unlike some other toxins, they bind to organic matter and are less likely to move. “A properly designed landfill could manage these materials indefinitely,” Reible says. He explains a secure disposal site would be monitored -- and lined and covered with clay and plastic. That’s because, if water flows, it can carry contaminants with it. 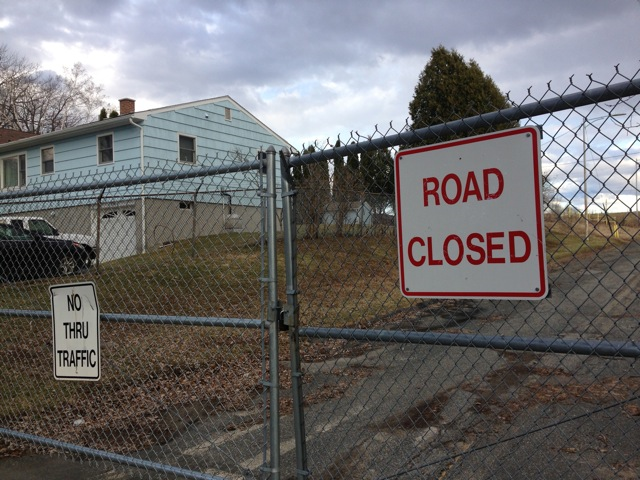 The EPA has argued there are problems with the proposed sites, such as “their proximity to the Housatonic watershed” and drinking water supplies. 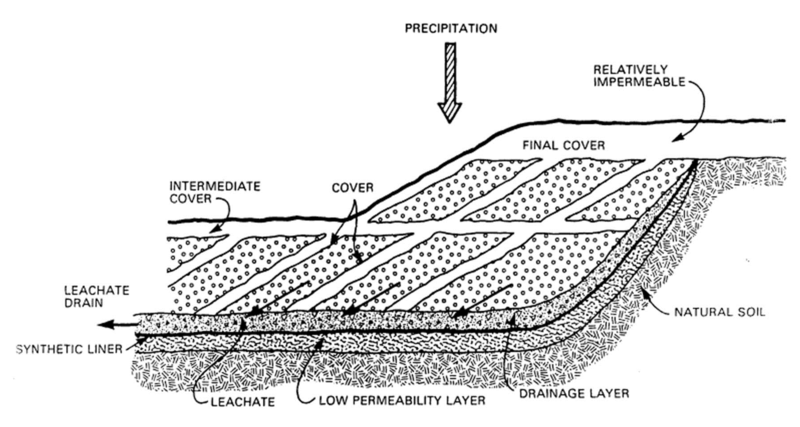 The permeability of the soil is another issue -- meaning that if multiple liners fail, PCBs might leak into the groundwater. Both the EPA and GE declined to be interviewed for this story. 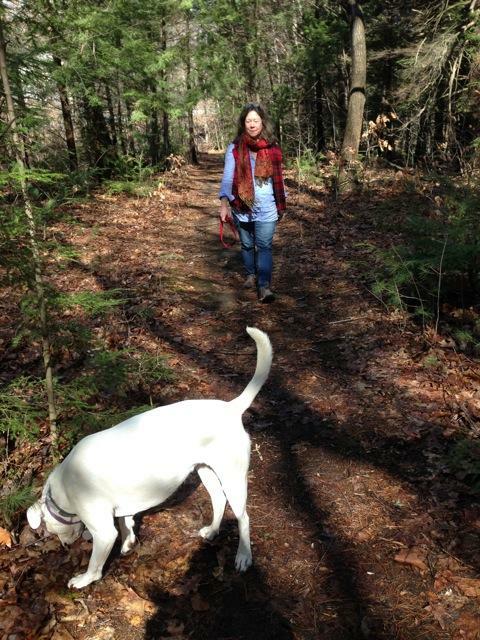 Amy Hagerty and her dog Luna walking on a trail along the Housatonic River in Great Barrington, Mass. General Electric wants to put a toxic waste disposal site here. One of GE’s proposed sites is in a wooded area, in the village of Housatonic, where locals hike. Amy Hagerty and her dog Luna lead the way through a forest high above the Housatonic River. “Luna, stop, stop!” Haggerty calls out as the dog tried to head down to the river. Hagerty says when her kids were young, they canoed here once. We get to a spot where the water below spreads wide. Known as Rising Pond, it’s upstream from a dam. The EPA calls for digging up 71,000 cubic yards of PCB sediment here. Hagerty explains where GE wants to put it. GE disputes that and says compared to shipping the waste elsewhere, local disposal would save about a quarter of a billion dollars. But Hagerty says property values in her close-knit community would plummet, and businesses would close if the PCBs were stored here. About a half-mile from the proposed disposal site, Hagerty owns a café. It’s a cozy place, selling coffee, eggs -- even peanut butter and kimchee sandwiches. Robby Baier stops by to pick up a decaf latte on the way to his recording studio. He wants GE to figure out how to treat and destroy the PCBs -- not dump them anywhere. One of the EPA’s arguments against local disposal is that fierce opposition could jeopardize the cleanup altogether. But GE argues that community acceptance of the disposal sites is not one of the criteria in the legal cleanup agreement. Schematic of a toxic waste dump. Danny Reible, the environmental engineer from Texas Tech, says he can’t comment on the viability of GE’s proposed sites, but he believes a good landfill design can address risks, even floods. And he says local disposal would avoid possible shipping accidents if the PCBs were moved out of state. People in the Berkshires already have experience with PCB dumps. GE and the EPA previously cleaned up two miles of the Housatonic in Pittsfield. The company shipped some of the sediment to facilities in New York, Michigan and Texas. But most of it ended up at the edge of a neighborhood -- right next to an elementary school. 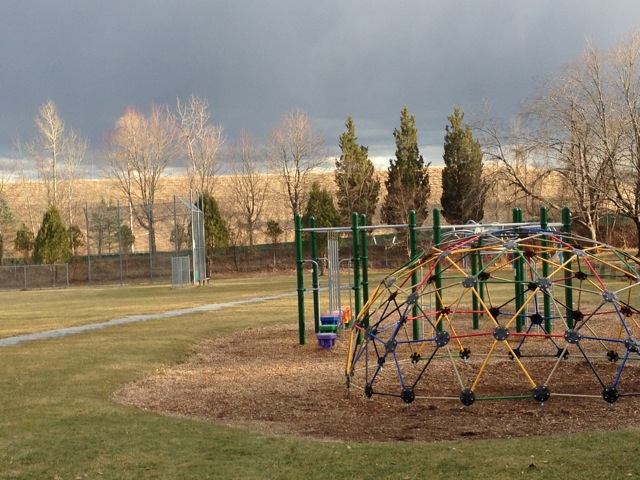 The Allendale Elementary School playground borders Hill 78, where PCB contaminants were buried during the first phase of the clean up of the Housatonic River in Pittsfield, Mass. City Councilor Kevin Morandi lives there --- near two PCB dumps known as Building 71 and Hill 78, which contain 245,000 cubic yards of PCB sediment. “You know, people have certainly died of cancer, but can you link it to that?" Morandi says. "No, not really." When Morandi first ran for office in 2008, Hill 78 was growing higher and higher as the clean up in Pittsfield progressed. Covered with a bright blue tarp, it was a visible reminder to residents of potential risks. By 2009, the two sites were filled. People don’t talk about them much today. Soil and grass now blanket Hill 78 and it kind of fades into the landscape. A road on the edge of the Allendale neighborhood in Pittsfield, Mass., leads to a PCB disposal site on used during the first phase of the clean up of the Housatonic River. Even still, Morandi has a message for Berkshire communities downstream. Where to put the toxic waste will be hammered out in front of EPA judges in early June. If GE loses its appeal, the company can take the case to federal court. Some Berkshire residents say that if GE is allowed to dispose of PCBs locally, they’d rather leave them in the Housatonic River.